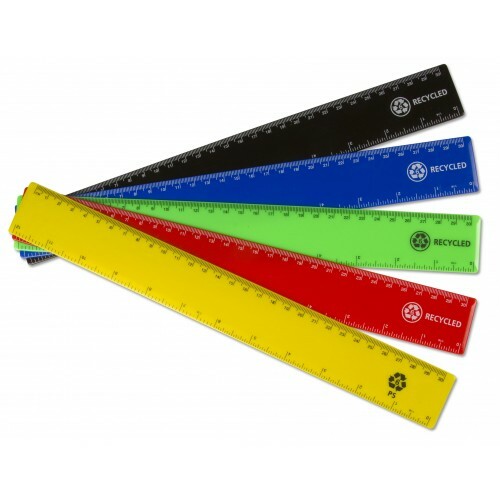 Large enough to serve the needs of busy organisations, our 50 x 30cm Recycled Plastic Rulers are crafted to last. Each one has been manufactured from strong, durable recycled plastic. This not only gives them a strength to withstand repeated use but also ensure they can be recycled again when they come to the end of their life. This economical pack features 50 of these brightly coloured rulers - with 10 of each of the 5 colours provided inside. Choose from a bright yellow, red, green, blue or black to suit your team colour, different department logos or just your personalities. Each one has a smooth back and rounded corners to minimise the risk of injury. They are printed with starkly contrasting line and number measurement indicators that can be seen from a distance and used effectively for their purpose. Use to accurately record the space between two markers or to draw a perfectly accurate line for any project. These rules are entirely wipe-clean and slip easily into backpacks with their lightweight construction. No matter whether you're drawing out the latest sketches for your new extension or developing your mathematical skills, these rulers provide the essential tool you need. The large and economical pack is ideal for busy organisations. It provides you with all the tools you need and gives you the opportunity to store them to one side or distribute them out instantly. Regardless of your choice, you can rest easy knowing they'll be right there when you need them for any task.